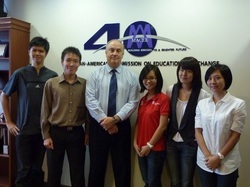 August 10, 2011 - The third batch of Malaysians UGRADers who have successfully completed their UGRAD journey gathered at the Malaysian-American Commission on Educational Exchange (MACEE) to receive their certificates from Dr. James Coffman, MACEE Executive Director. Also present at the event was guest of honor, U.S. Ambassador Paul Jones. Global UGRAD returnees also spent some time presenting about their fabulous experiences in the States and expressed their gratitude to US Department of States, MACEE, World Learning and the Global UGRAD program for this once-in-a-lifetime opportunity. Aug 8, 2011 - The Malaysian-American Commission of Education Exchange (MACEE) organized a pre-departure orientation for the new batches of Malaysian UGRADers who are set to embark on their journey this August. As their departure date gets closer, the pre-departure information provided will assist them to make all the preparations that are necessary for staying healthy and safe abroad. Check out our "What's New" page to follow their journey in the USA. We wish them all the best and enjoy this amazing UGRAD journey!! Bon Voyage!! May 20-22, 2011 - Global UGRAD alumni, Ryan and Thamil attended the 2-days Alumni Development Workshop organized by MAAP at Gurney Hotel, Penang. This workshop was themed "Developing the Malaysian Alumni Leaders of Tomorrow" and was conducted Jim who went to the States on the International Visitor Leadership Program - Alumni Development. 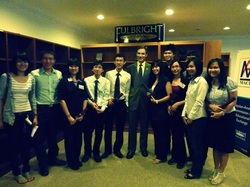 Alumni from various US Exchange Program like SUSI, YES, YLP and UGRAD gathered and shared their leadership experience. Among the topics were organization building, communication skill, networking & fund raising. July 19, 2010 - ECA Deputy Assistant Secretary for Academic Programs Alina Romanowski hosted an Alumni Roundtable for 20 alumni of the Fulbright Program, Hubert Humphrey Fellowship, The Study of the U.S. Institute, UGRAD and English ACCESS Microscholarship programs. In her opening remarks to the group, Ms. Romanowski thanked the alumni for their work in extending the impact of their exchange programs in Malaysia. She also encouraged them to continue to be proactive in building relationships between alumni of different programs. June 21, 2010 - The second batch of Malaysians UGRADers who have successfully completed their UGRAD journey gathered at the Malaysian-American Commission on Educational Exchange (MACEE) to receive their certificates from Dr. James Coffman, MACEE Executive Director during the Global UGRAD Exchange Program Debriefing Session. Also present were UGRAD alumni and the new UGRADers. May 30, 2010 - UGRAD alumni organized a gathering to meet up with the new batch of UGRADers who will be embarking on their UGRAD journey in Fall 2010. Alumni (Sean, Gin Seng, Khai Sheng & Khai Shing) shared their stories and experiences, provided valuable advice and guidance, and answered queries to help the 'juniors' (Choon Sian, Shi Ee & Zao Lon) better prepare for their brand new journey. April 19, 2010 - Following the first alumni dinner, alumni leaders from various exchange programs such as Global UGRAD, Youth Exchange & Study (YES), Hubert Humphrey, Study in the US Institute (SUSI), & Fulbright met up for a dinner with guest of honor Ms. Maura Pally (Acting Assistant Secretary of State Bureau of Education & Cultural Affairs). Mr. Nicholas Papp urged all alumni to support the English Language Camp that will be led by YES. This will be part of the effort to bring all Malaysian alumni members together and strengthen our ties as we give back to the community. 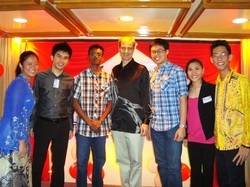 March 2, 2010 - US Embassy Cultural Affairs Officer, Mr. Nicholas Papp, hosted a dinner at the Royale Chulan Hotel to honor the State Alumni Member of the Month. Alumni leaders from several exchange programs gathered for the first time to share experiences in the US and discussed opportunities to strengthen alumni programs in the coming year. Khai Sheng and Khai Shing had the pleasure to represent the Global UGRAD Alumni in this event. Rachel Thum and Tang Khai Shing, both Advanced Diploma in Commerce (Financial Accounting) students from Tunku Abdul Rahman (TAR) College was selected for the Global UGRAD program in 2008. 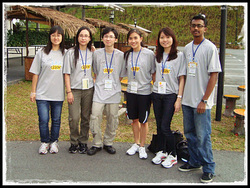 In 2009, another 4 School of Business Studies students (Gin Seng, Eng Hwa, Anna Lim, & Poh Suan) were selected for this program. Rachel & Khai Shing shared about their experiences in U.S. with the principal and their juniors who will soon embark on their UGRAD journey. June 16, 2009 - The first batch of UGRAD alumni met up with the new UGRADers who will be embarking on their UGRAD journey in Fall 2009. Having gone through the same situation a year ago, the alumni shared their stories and experiences, provided valuable advice and guidance, and answered queries to help the 'juniors' better prepare for their brand new journey. June 12, 2009 - The first batch of Malaysians UGRADers who have successfully completed their UGRAD journey gathered at the Malaysian-American Commission on Educational Exchange (MACEE) to receive their certificates from Dr. James Coffman, MACEE Executive Director during the Global UGRAD Exchange Program Debriefing Session. They also shared their interesting and insightful experiences in America with Dr. Coffman, Ms. Kaliswary Subramaniam, Fulbright Program Officer (Malaysian programs) and the other participants.